Before Brenda spoke on stage, she was pouring into teens through mentoring, teaching, and counseling. In addition to raising her own teens, Brenda is an award-winning educator, earning the Powerful Connection Award for teachers in 2003 & 2004 as a high school and middle school teacher. After obtaining a Master’s Degree in Clinical Mental Health Counseling, she currently is a school counselo r for 5th and 6th graders, in addition to counseling teens in private practice. Brenda’s powerful seminar and youth retreat “Blurred Lines: Being Real in an Artificial World” has reached standing room only crowds from Iowa to Kansas City, MO. 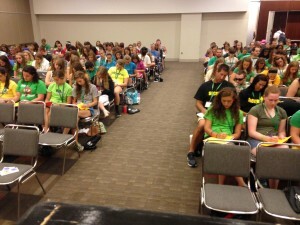 The message is universal for an all-girl retreat, but also to youth groups of mixed gender, as evidenced in the 300+ standing room only crowd at the national Youth Conference in Kansas City. Find out what attendees said about it here. The Blurred Lines seminar is unlike any other youth seminar. Brenda engages teens to articulate various messages they receive about identity, and proceeds to help youth personalize their strengths. She then honestly presents 10 ways teens can be real in their culture, today. Brenda’s experience with teens, engagement in public schools, and awareness of current societal struggles equips her as an expert on authenticity with teens. If you’d like to bring this conference to your church, school, or area, contact Brenda here or email her at yoderbl@gmail.com.